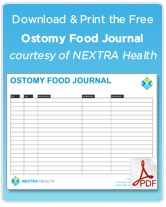 For new ostomates, the first step of taking care of your ostomy is to first understand all of the ostomy supplies, how to use them correctly, and how they work. You should do this first because you’ll be changing your own appliances, but you’ll also be able to communicate more effectively with healthcare professionals and retailers providing your ostomy supplies. Brand Names: You’ll find many leading manufacturers of Ostomy products, and you may get recommendations for different reasons. 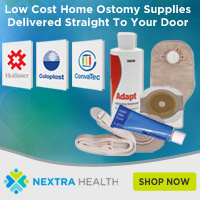 Three of the biggest providers of ostomy supplies are Hollister, Convatec, and Coloplast. There are online medical suppliers who can supply discount ostomy supplies. Skin Wafers – A Skin Wafer, or “flange”, fits around the stoma. Since stomas can come in all shapes and sizes, the wafer typically requires cutting unless the manufacturer will pre-cut them for you. There are moldable wafers on the market, but most will require cutting to fit the patient’s stoma. Ostomy Pouches – There is a lot of variety in ostomy pouches – they come in all shapes, sizes, and types. “One Piece” vs. “Two Piece” – The “one piece” system means the pouch is directly attached to the skin wafer. The “two piece” system means the pouch can be detached from the wafer and replaced, emptied, and/or cleaned. “Closed End” vs. “Open End” – An “open-ended” pouch is drainable and reusable. The bottom is closed off with Velcro or a clip. A “closed-end” pouch has no opening, so it’s not reusable but is preferable for outdoor activities and swimming where leaking could occur. Sizes of Pouches – Pouches can come in a number of sizes, including small pouches designed to be more discreet (but will have to be changed more frequently). Adhesive Remover – An adhesive remover wipe is used to treat the skin where the wafer attaches around the stoma. It helps keep the skin clean and non-irritated. Skin Barrier Wipes – Skin barrier wipes are applied before putting a new stoma onto the skin. They help keep the skin around the stoma infection-free and wound-free from the adhesives needed on the wafer. It will help ensure the adhesive on the wafer will stick. Stoma Powder – Stoma powder helps dry up moisture so the wafer sticks well and promotes healing for irritated skin. Stoma Pastes – Helps the wafer stick well and evens out the skin surface so the wafer adheres confidently. Barrier Rings – Like the stoma pastes, it helps even out skin surface and keep the wafer in place. Ostomy Belt – The belt will help the wafer in place against the body by putting pressure on the edges. Soap – Cleanliness is next to godliness. Or at least keeps infections away. Several washcloths – You’ll want clean cloths to wipe any leakage or waste as well as to dry off the skin or appliances before applying them. Mirror – This can be useful if you need to get a good view of your stoma while handing your wafer our pouch. This is a brief overview of what you should keep handy in your “ostomy kit”. If you’re active, working, swimming, in school, or travelling, you should always pack a separate kit to take with you. The best way to ensure you’re always with your tools is to bring two extra sets of supplies (wafers, pouches, pastes, etc.) with you at all times. This way, if you have to use one, you’ve got another accessible to you in case of emergencies. My son is two years old and he has to wear an ostomy bag i need information and prices of bags and supplies please contact me. My husband has to wear this bag , and i am trying really hard to do this all in the right way, but his bag leaks alot and constantly have to change it ,, thus causing his skin to be irrated and rashie, i use the powerder, but i am lost , i am learning but if is a simplier way or something i am not doing , please ??? ?